Was Iran Air Flight 655 shot down by mistake? Iran Air Flight 655 is allegedly a case of "mistaken identity". Is it possible for AEGIS with most advanced radar system ever put on a ship, not to be able tell a difference between an F-14 and twice as large Airbus A300? Although many analysts have tried in the past 15 years to point to a single factor theory, the general consensus remains that the shoot down of Iran Flight 655 was caused by a multitude of factors. In the interests of time, we have attempted to simplify those factors into two main categories: Human error and Mishaps due to the human/system interface. By human error, I mean poor decision making and erroneous expectancies and other psychological factors that contributed to an inaccurate portrayal of the actual situation. Many human errors were directly caused by deficiencies in the Vincennes’ automated system as well as a lack of training that led to faulty interpretation of data and more errors. You specifically ask: "Is it possible for AEGIS with most advanced radar system ever put on a ship, not to be able tell a difference between an F-14 and twice as large Airbus A300?" to which the answer is absolutely! The AEGIS is not an imaging radar. As such, when a return is received by the system, and attempts to identify a target, there are numerous geometries to consider. As such, an A300 and an F-14 could give a return that doesn't classify the aircraft by type, but rather by a radar cross section which will be dynamic based on the flight profile of the aircraft. As such, a nose on picture of an A300 may easily be confused for a beam profile of an F-14. 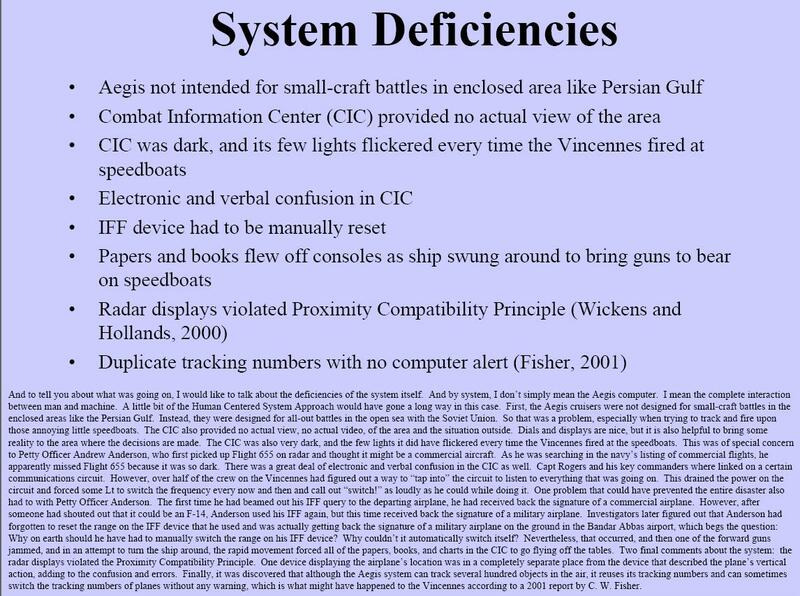 The AEGIS system didn't receive the baseline 6 upgrade that allowed it to perform non-cooperative target recognition until 1994, from a program started in 1992. Keep in mind, the AEGIS radar system was developed in the early 1970s. This event occurred in 1988. You are attributing a level of technology to the event that is disproportionate compared to today's technology. Even though the AN/SBY-1 is currently in use, that doesn't mean that the system hasn't undergone numerous changes since then. And even still, the system has specific limitations. As slide 15 shows, they are many, and in some cases severe. And to tell you about what was going on, I would like to talk about the deficiencies of the system itself. And by system, I don't simply mean the Aegis computer. I mean the complete interaction between man and machine. A little bit of the Human Centered System Approach would have gone a long way in this case. First, the Aegis cruisers were not designed for small-craft battles in the enclosed areas like the Persian Gulf. Instead, they were designed for all-out battles in the open sea with the Soviet Union. So that was a problem, especially when trying to track and fire upon those annoying little speedboats. The CIC also provided no actual view, no actual video, of the area and the situation outside. Dials and displays are nice, but it is also helpful to bring some reality to the area where the decisions are made. The CIC was also very dark, and the few lights it did have flickered every time the Vincennes fired at the speedboats. This was of special concern to Petty Officer Andrew Anderson, who first picked up Flight 655 on radar and thought it might be a commercial aircraft. As he was searching in the navy's listing of commercial flights, he apparently missed Flight 655 because it was so dark. There was a great deal of electronic and verbal confusion in the CIC as well. Capt Rogers and his key commanders where linked on a certain communications circuit. However, over half of the crew on the Vincennes had figured out a way to "tap into" the circuit to listen to everything that was going on. This drained the power on the circuit and forced some Lt to switch the frequency every now and then and call out "switch!" as loudly as he could while doing it. One problem that could have prevented the entire disaster also had to with Petty Officer Anderson. The first time he had beamed out his IFF query to the departing airplane, he had received back the signature of a commercial airplane. However, after someone had shouted out that it could be an F-14, Anderson used his IFF again, but this time received back the signature of a military airplane. Investigators later figured out that Anderson had forgotten to reset the range on the IFF device that he used and was actually getting back the signature of a military airplane on the ground in the Bandar Abbas airport, which begs the question: Why on earth should he have had to manually switch the range on his IFF device? Why couldn't it automatically switch itself? Nevertheless, that occurred, and then one of the forward guns jam med, and in an attempt to turn the ship around, the rapid movement forced all of the papers, books, and charts in the CIC to go flying off the tables. Two final comments about the system: the radar displays violated the Proximity Compatibility Principle. One device displaying the airplane's location was in a completely separate place fro m the device that described the plane's vertical action, adding to the confusion and errors. Finally, it was discovered that although the Aegis system can track several hundred objects in the air, it reuses its tracking numbers and can sometimes switch the tracking numbers of planes without any warning, which is what might have happened to the Vincennes according to a 2001 report by C. W. Fisher. These limitations agree with the Cracked article as well. In the comments section, you assert: "AEGIS is computerized, so it should contain radar signatures recognition" as well as "I do know how classifiers work. On images, sound, SONAR, RADAR, whatever.. And it's not some crappy airport radar, we're talking about one of most modern phased array radars" However, I would contend that you don't know how the AEGIS radar of 1988 worked. Especially given the thorough outline of the system interface as discussed in slide 15 as well as the Cracked article. And again, it doesn't matter what sort of resolution or differentiation the radar itself can make if the cursor and display do not present that information. The humans in the equation can still make mistakes, which seems to be the overall conclusion of MIT, international courts, and experts in the field. You seem to be conflating the capabilities of the AEGIS radar as it stands today, given advances we have made since 1988. Not the answer you're looking for? Browse other questions tagged united-states history aviation military . Can a commercial flight be mistaken for a fighter jet? Was the US nuclear missle launch code set to 00000000 for 15 years of the cold war? Was Leonardo da Vinci a polyphasic sleeper? Did the Philadelphia Experiment ever take place? When John McCain was shot down was his mission to bomb a civilian light bulb factory?